Time has passed, but how much time? You are older. I am old. We have walked these high Alps all our lives. But that day I walked alone. I remember a cold clamminess to the morning air, a sour metallic smell in my nostrils. I was young and confident. I carried no overnight gear, no food, no compass. I’d bet on the mist lifting with the weak March sun – and I lost that bet. Instead the mist lowered, darkened, thickened to a soup. 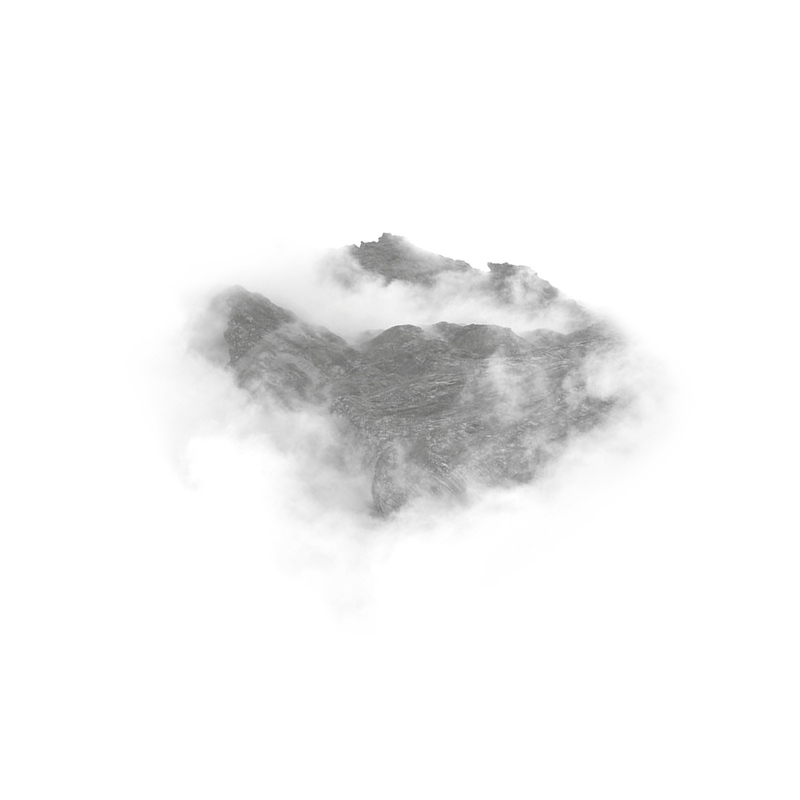 As the day passed, great drifts of fog obliterated the world, piece by piece: mountain, tree, rock, path. Soon my own boots were nothing but shadows beneath me. In this false dusk I was caught off-guard: the clack of rocks loosened by my own feet echoed back to me across the valley and seemed the comforting proof of other walkers ahead. I was wrong: there were no others, and with good reason. Apprehension drove me on. Yet my steps grew ever-slower and more tentative. I dreaded falling. To lie crippled up here was a slow and certain death. My boot had rubbed my sore heel until it bled, but I dared not stop to attend to it. Now and then the fog opened like the mouth of a whale, revealing some fragment before swallowing it again. One of these openings afforded a brief glimpse of rusted metal. Something human, then? My hopes rose. As I struggled blindly towards it I scoured my memory and recalled climbers’ talk of an isolated shepherd’s hut. What had happened to the old shepherd? I could not remember. Suddenly the hut was before me: a low stone structure with one tiny window tucked under the overhang of a corrugated roof, like a small black eye. Directly in front of it a deep hollow was scooped into the hillside, like the bowl of an extinct volcano. To reach the hut I was obliged to walk its perimeter. I did so, with some trepidation. The bowl was half-filled with greyish fog which seemed in some curious way to move; to shift and resettle with a constant, uneasy motion. I reached the door without mishap. Sitting there now – had it been there before? – was a black-eyed sheepdog. I raised a hand to the rough-hewn wood and pushed. Inside, the air smelt dank, metallic, ripe. Was that sweat? Boot grease, perhaps. Before my eyes could adjust I bumped into a table and heard it scrape on the flagstones. I ran my fingers along the grain that ran like raised tramlines along its length. No crumbs. An iron stove was cold and dead to the touch. The dog had disappeared again into the shadows, but a soft ticking sound led me to a brass wall tap dripping water into a full bucket. I bent to slake my thirst – and as I did so heard a heavy skittering just outside, and footsteps – these not approaching but receding. Someone was running away! I ran outside; I shouted. But my voice was deadened by the fog. The footsteps receded, careering recklessly downhill, loose rocks tumbling after them. At that pace it would have been impossible to stop. To risk broken bones in this way spoke of some desperate need, but for what? At any rate, the only possible human company was gone. I stood wrapped in whiteness, chilled to the bone and more alone than ever. As I turned back I noticed a tethered post that served to block a break in the wall of the hollow. I glanced down and what I saw there made me freeze. What I had earlier taken for trapped fog was a herd of sheep – a hundred and fifty at least, their fleeces dank and matted, flanks sagged with starvation, black eyes shining in their sunken sockets. I shuddered involuntarily and retreated inside. That night I lay sleepless on damp straw as the wind whistled down the cold stovepipe. Each time I turned my aching bones I found the eyes of the dog on me. Dawn barely penetrated the fog. I rose, restless to be gone. The dog watched closely as I bathed my heel in the tin bucket, tore a strip from my shirt and stuffed this makeshift bandage into my sock. I listened for footsteps but there were none. I felt certain that no-one would return to feed the dog. I loosened its tether and let it out. It leapt with joy and disappeared into the whiteness. With a momentary pang I too set off, taking the opposite direction: downhill. I walked with great purpose: I was determined to fight off my sleepless night, my aches and pains and my lethargy of spirit. Yet try as I might I could not keep to the path. Perhaps it was simple weariness, perhaps a more fundamental disorientation. I no longer trusted my feet; they stumbled where they had been sure, hesitated where no hesitation would help. The sheep tracks converged and diverged at random. Spring waterfalls had dislodged rocks, forcing me to adjust and readjust an already tentative route. Eventually the pain in my heel became unbearable. As the thin light failed it was only with grim determination that I forced myself up a steep rise that I hoped might offer a view, however limited. At the summit I peered into a fog-bound world – and to my horror made out directly below me the tin roof of the shepherd’s hut. The dog turned its face up to me in mute reproach as I descended. I passed it by without a word or a gesture, and limped inside. That night as I lay shivering in the dark I recalled the morning I set off, leaving you to sleep. How long ago, I wondered, was that day? I felt time slip from me like a discarded skin. I must have dozed because the restless movements of the sheep invaded my dreams. I woke in a sweat, convinced something was wrong with them. I did not want them to die there, so near to me. Stepping outside, I slipped the knot that tethered the gatepost and stepped back. But the sheep did not leave. Must I order them out to graze? They had nothing to eat in the hollow that I could see. I made some vague gesture. The dog joined me and slunk at their flanks, encircling, intent. Nothing happened. Well, they could starve if they wanted. They watched me as I set off again. I forced myself uphill this time and was soon rewarded when, with relief, I felt the ground level off and fall to a valley. My confidence grew. Though the path was surely a path you and I had never taken – nor any climber before us – no matter: I was heading out of this cursed place and back into my own world. How many hours passed before exhaustion eventually slowed me? Exhaustion – and dread. For I recognised a familiar arc to the escarpment I was climbing. My heart sank as once again I looked down from the summit and made out the tin roof of the shepherd’s hut below. I barely restrained myself from kicking the dog as I limped in. Its intent black eyes seemed too anxious that I understand what I did not want to understand. That night I locked it outside with the sheep. When I woke the fog persisted, thick as ever. Was it night or day? And which day? I could no longer tell. I examined the mysterious tools that lay about the shack and found one with which to remove a stone from a hoof. Another seemed designed for clipping out burrs from dense wool. I was as hungry as I had been on arrival, but no hungrier. When I remembered my old life I felt a surge of desire for human time, portioned and rationed: for minutes and seconds, for appointments, calendars, clocks. Time here was shifting, tidal. The wound on my heel was too raw to allow me to walk today. I found myself sharpening a hook designed to remove ticks from thick fur. I wondered if this ailment was the source of the herd’s strangely agitated passivity. The unexplained absence of the shepherd made me feel obscurely responsible for them. I decided to enter the hollow and inspect the livestock. Barefoot, I limped outside. The dog lay in a tense mockery of sleep, only its brows betraying its eager desire to leap up and obey. I slid down the slope into the hollow and immediately felt a pulse, something like electricity in the air. The sheep seemed to wake. As I shoved through them to make space for my inspection they shoved back. I had no sooner cornered one than three pressed against me, insistent, attentive. I felt mouths about my clothes, tugging at seams, ripping off buttons. I struck out. But nothing would stop them. I cried out. I swam my way through the bodies of the sheep but there was no inch of space. I stumbled – fell to my knees – their blank eyes now level with mine, their long mouths chewing, tongues working machine-like, relentless. And then a sound, the unmistakeable echoing clip of hiking boots on rock as someone stumbled round the perimeter of the hollow. The dog raised its head. Tears stung my eyes. I cried out again. The figure – a hiker? – heard and was now wading into the mad swarm. The sheep turned as one, surging over one another to surround the newcomer. For a split second I could breathe, move. Frantic, I somehow scrambled up the wall of that pit and launched myself out. There were tools in the hut – knives – a spade. I would return, fight them off. I meant to. I am still convinced of that. Yet even as I made for the hut door I felt a change of some kind. It was imperceptible almost, like a drop in air pressure. In a sudden flash of awareness I knew where I was! Ahead of me, hidden by a bank of fog, lay the shoulder of the tarn. How had I not remembered? And beyond it – yes – the torrent, the southeast pass, my valley! Instead of slowing at the hut door my feet picked up speed. I shot past and did not look back. If the stranger made a cry it was deadened by the fog. I would gladly have stopped, gladly, but my bare feet would not let me. They leapt from icy rocks into drifts of late snow, over shale and sharp flint. They carried me downhill faster than I could think, in a desperate strike for home. It was nightfall when I limped, bloodied, into our village. I registered odd changes – a new kerbside sign, a tree that was not there when I left – before fatigue overwhelmed me. My knock at your door must have been feeble, but you answered. I had time to recognise the expression on your face – it spoke more of horror than relief – before I blacked out. The trunks of the birches have thickened, silvered like your hair. You say I was gone for twenty years, but what can that mean? I tell my tale again and again for fear of losing your faith, or losing my mind. But I omit one detail: the arrival of that stranger whose bones lie in the hollow with those of the shepherd. Whose end in that hideous fog signalled my own release. Well done! Good atmosphere- or should I say bad? I’ll nerver trust a herd of sheep again! Fantastic story. Truly spooky. I’ll never go walking on my own again. Beautifully paced, lovely build-up, great descriptions – enjoyed the sense of dislocated return.